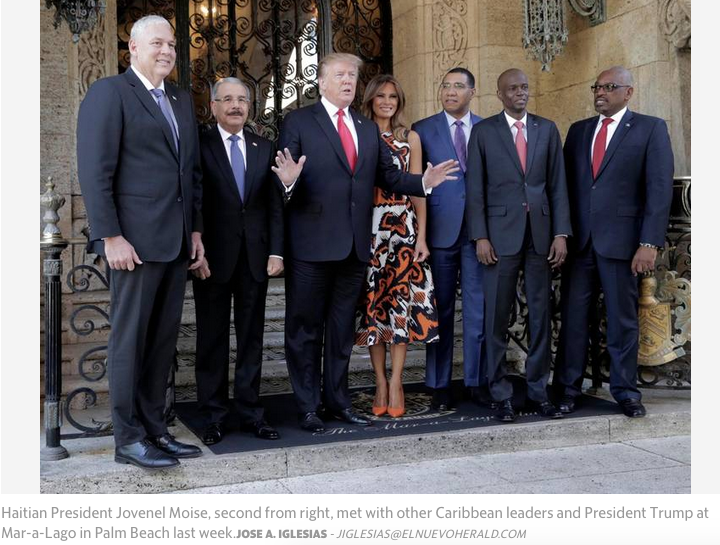 Last month, five Caribbean heads of state and government — the leaders of Haiti, the Bahamas, Dominican Republic, Jamaica, and Saint Lucia — met with President Trump at his Mar-a-Lago resort in Florida. The media’s coverage since has been dominated by the Venezuela debate, with little attention paid to the successful talks that took place on renewed U.S. engagement in the region, beginning with the very welcome step of the U.S. committing to a visit from the Overseas Private Investment Corporation to assess projects through which it can invest and collaborate. The Caribbean and the U.S. have for decades been bound by common interests, yet dialogue among our nations has not been as open as it should have been, until now. At the forefront of the agenda last Friday was investment in the Caribbean and the mutually beneficial opportunities that exist between our region and the U.S. My country, Haiti, is facing its fair share of economic challenges, but a context like ours presents enormous opportunities too. It’s not only the quality of opportunities that make talks like those we had in Florida productive; it’s also the fact that President Trump clearly recognizes that when other countries in his shared neighborhood gain investment and development, there are benefits to the neighborhood as a whole. Greater investment in the Caribbean not only helps to bolster U.S. security, but economic prosperity in the Caribbean brings more stability for our trading relations. And with the U.S. as Haiti’s primary trading partner — in 2016 the U.S. marked a $4.6 billion trade surplus — it is a win-win situation. Meaningful growth in Haiti requires foreign direct investment so that innovation can flourish, long-term jobs can be generated, and the infrastructure critical to a modern economy can be built. The Haitian government has ambitious strategic plans and projects in the works. Our government is rebuilding our nation’s water supplies and infrastructure, much of which was destroyed by earthquakes and hurricanes. We have plans to irrigate tens of thousands of hectares of land. This would have the effect of combating food insecurity challenges and supporting farming jobs, both critical points, as agriculture accounts for 50 percent of Haiti’s employment and 22 percent of its GDP. Haiti’s president, Jovenel Moise, also has plans that could deliver 24/7 electricity to the entire country. Today only about 25 percent of the population has access to electricity, and most for just a few hours each day. The government has developed a strategy that entails improving the national grid to connect large urban centers, building microgrids in the smaller population centers that currently have no access to electricity, and providing solar power systems to all remaining households across the country. Construction is scheduled to begin on a high voltage grid connecting our capital city, and private companies have already invested millions in the development of microgrids. But a project on the scale of providing energy to an entire nation presents rare and plentiful opportunities for many more investors to take part. We are not seeking charity. We are confident that the returns to be made from various projects and sectors in Haiti are considerable. That’s the big difference, after all, between “aid” and investment: the returns. Trump understands that. He understands that he can support his neighbors while creating gains for U.S. businesses. President Moise is also a businessman rather than a politician by background, and when two businessmen sit across the table from one another, it’s easy for both sides to understand that this ought not be a handout, but a joint venture. If there weren’t value to be had for both involved, they wouldn’t remain seated at the table. The significance of the Mar-a-Lago meeting cannot be overstated: Saint Lucian Prime Minister Allen Chastanet summed it up perfectly last week when he said that this type of engagement with the U.S. hasn’t been seen since President Reagan in the early 1980s. There has never been a better time for U.S.-Caribbean economic engagement, and with a partner like President Trump, we might just have the key. Bocchit Edmond is Haiti’s foreign affairs minister.